This thesis project makes real-life animated GIFs! Wait … what? Suffice it to say the Internet (and some Digital Trends staff members … ) have an obsession with animated GIFs. And if you’re really, really obsessive over these animated images, you can (sort of) play around with GIFs in real life with GIFTY. 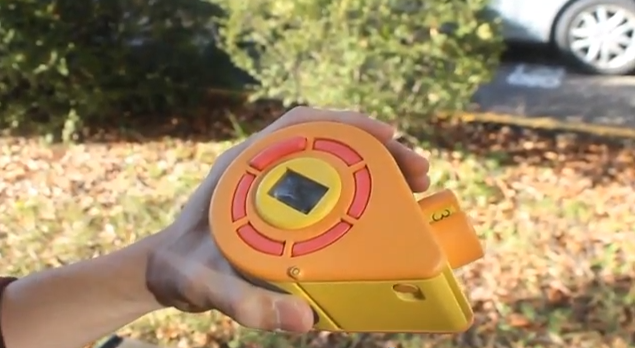 GIFTY looks part-toy, part novelty camera, which isn’t too far off from what it actually is: GIFTY is a college student’s thesis project that plays off of the Internet novelty of GIFs. The camera, or GIF machine if you’d rather, shoots animated GIFs and prints it from the same camera like a Polaroid camera. Kind of like how Vine limits the recording time, GIFTY counts down until its timer reaches zero, which is when the recording session finishes. The resulting images, frame by frame, are printed photo booth style onto Zink ink-less paper; while you can’t really make a real-life GIF on just a sheet of paper these photos can be cut and stitched together into a flipbook. OK so really, this is just a device that makes creating a photo flipbook way faster and more fun, but it’s pretty good Internet spin to call it an animated GIF printer. Obviously this style of animation isn’t digital and it’s bulky (and again … it’s just a flip book maker), but if you want those Arrested Development GIFs in physical form, it might be your best bet. And maybe someday, maybe we will be able to print animated GIFs. We can dream, right? You can check out the video below to watch GIFTY in action.